We finally had the big day! All in all, it was a roaring success (i.e., all the kids had fun and the EpiPen was unnecessary.) The first preparation for the social event of the season, after reserving a shelter at the park, was to send out the invitations. 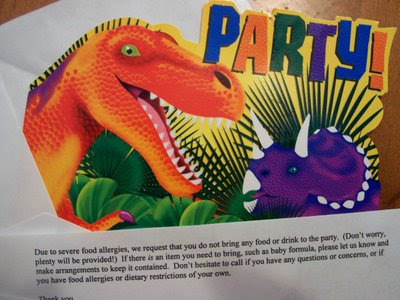 I included a slip of paper requesting that no food or drink be brought to the party and made sure I provided all my contact information for the other parents. For the party itself, we planned a few activities for the kids. I bought a variety of bubble makers: big ones, little ones, battery operated ones, crazy wands, and a huge bottle of bubble juice. They kept the kids (and my husband!) occupied for a surprisingly long time. 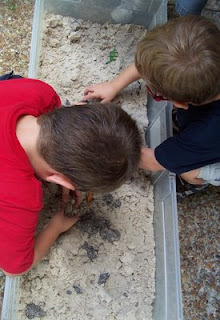 If you are having an outside party, I really recommend making bubbles as a noncompetitive fun activity. I'm pretty sure we'll do it again next year, and reuse all the same equipment. The food was a lot of work, but turned out great. Unfortunately, I didn't take any pictures before we ate, so I just got a few shots of the leftovers. (As I post all the recipes I made at the party, I'll come back and add the rest of the links.) 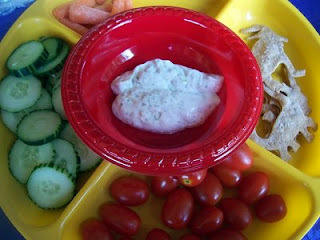 For starters there was a vegetable tray with Ranch Dip, the always popular Dinosaur Crackers with Cilantro Hummus, and tortilla chips with Zesty Tomato Salsa. For the meal we had Pterodactyl Drumsticks, both turkey and Sunbutter & jelly dinosaur sandwiches made with this sandwich cutter. (I wish I'd gotten a picture of the tray, since I alternated whole wheat and potato bread sandwiches, making a very pretty tesselating pattern.) I also made calzones with this pizza recipe, both vegan (for friends who keep kosher) and turkey sausage. 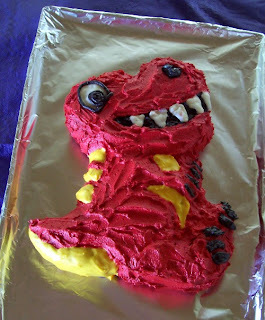 The all important dinosaur cake (made with this pan) was red velvet, per The Kid's request. Fearing a recreation of the scene in Steel Magnolias with the infamous armadillo groom's cake, I decide on red frosting. My mom was kind enough to do the actual decorating of the cake, since I just am not talented at creating cartoony frosting characters. 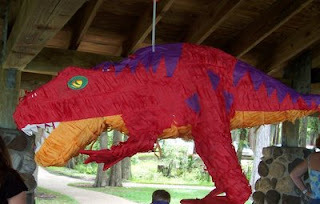 The T. Rex pinata from iParty was definitely the climax of the party. 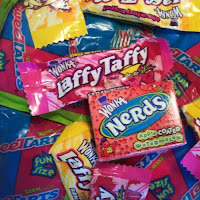 I found a three pound bag of safe candy, and stuffed that thing with enough sugar to keep The Kid and his friends buzzed for days. The pinata was unfortunately a little too sturdy, and I ended up having to partially disembowel it with the pinata stick after the kids had thoroughly beaten up on it so that they could knock the candy out of it. Here are a few suggestions for those who haven't done pinatas before: I decided against blindfolds and spinning, since there are kids with some motor/balance problems in the group. We lined them up from shortest to tallest to make sure the younger ones all had a good shot at it, which proved unnecessary, since it didn't want to break open at all. I learned it's a good idea to discretely weaken it before hand, so that the kids can actually break through it. Also, don't hang the thing until you are ready to actually hit it, since the kids just fixate on the candy in the sky as soon as it is up. The bags themselves were a couple of dollars at the craft section at Walmart. I picked up the crayons for about ten cents a box in the Back to School section there. The dinosaur stickers and "Play D'oh" came from my stash, so I'm not sure exactly what their source was. I picked up the dinosaur pencils and snap together gliders (not on theme, but kinda cool) from the clearance aisle at iParty, and printed out some dinosaur coloring pages to roll up and tie with curly ribbon. 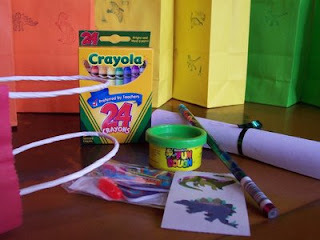 To involve The Kid in the bags' preparation, we had him decorate the bags with these dinosaur stamps, which had previously been given to him as a gift by his Grandma. It was an exhausting day, but worth all the hard work. The Kid was able to have a "normal" birthday party and can't wait for his next one! Everything looks wonderful! Did you use any special recipe for the red velvet cake or did you just color your normal white/yellow cake? I just looked at the sandwich cutter and it is really cool! I love that there is so little waste. Thanks for the link! What a great party. You're a good mom, that's for sure! You illustrate how, with love and ingenuity, you can make great-looking and tasting foods for allergic kids. maggie, I've put in the link for the red velvet cake. I've made it in tons of colors. The only ones that don't come out well are blue and purple. Just omit the cocoa powder for yellow. foodallergymom, the crackers are time consuming, but taste incredible. Let me know how the gf version comes out! jenny, thanks for the sweet compliment. The other ingredient for a successful party was lots and lots of help from my family!